English | 株式会社小林順蔵商店 / J. Kobayashi Co., Ltd.
We will join “JAPAN’S FOOD EXPORT FAIR” from the 10th to the 12th October 2018 in Tokyo!! We will assist you in importing Japanese sake to your country. Sake Brewery Tours with our partner from Switzerland. Yutaro Kobayashi, the president of J. Kobayashi., Co Ltd, delivered “Japanese sake” lecture at the University of Tottori. Brand-new English webpage officially open! A culture has been advancing by encountering with new cultures, values and different philosophies. We create such opportunities all over the world for Japanese Sake. The sophisticated craftsmanship of Touji, the history of Sake breweries inherited for more than hundred years, and its complexity and profoundness of tastes and smells; we can be proud of every aspect of Sake culture. We eagerly work in order to increase the number of this respectful Sake culture fans on the globe. A full support deliver of products including an onsite communication in any location in the world, a product proposal from our strong network with breweries, and air / sea logistic arrangement with thorough quality control. In addition, we prepare export documents for any countries which have Free Trade Agreement. At the last, we offer any additional services on demand such as multi-language labels on bottles. In order to sell Sake, it is required to make consumers understand what Sake is. We support importers organizing events from introductory Sake events to knowledgeable seminars with a cooperation of breweries. Sometimes, we take brewers to your country for explanatory session in the events. On the other hand, we support brewers organizing events in Japan to carry out market research and product promotion targeting inbound tourists to grasp the trend in the world. Even in the age of internet, it is difficult to catch live information on time. For importers, we deliver local sake information, not only the products, such as history, passion and advancement of breweries. Additionally, we bring the latest trend to the world from the field of Sake, Japanese culinary and even in the scale of Japanese culture. As a contrast, it is also important breweries to understand what is happening oversea. 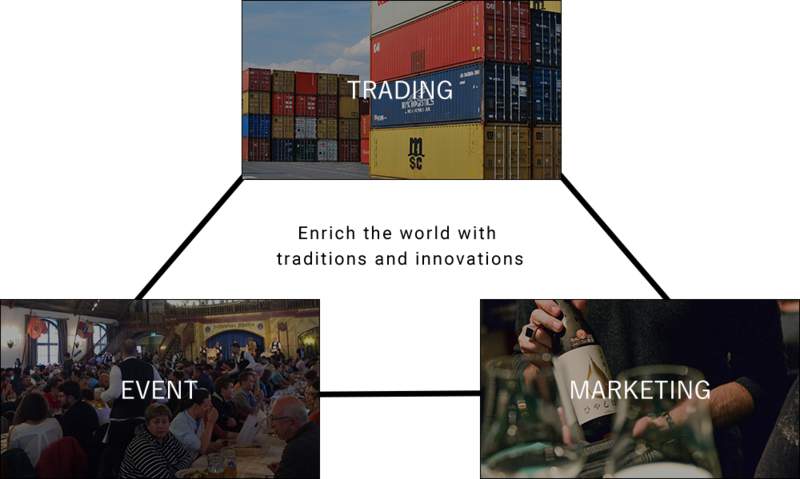 So, we deliver local custom, culture and market information of the other countries to the brewers. Japan is an island sandwiched between warm and cold currents: thus it rains in summer and snows in winter. This unique weather enriches the island and provided Sake; the essence of Japanese culture derived from the rare geographic location . When you close your eyes when tasting Sake, you will see the nature of Japan. The taste of Sake shows different faces with situations, temperature, and of course with what kind of foods people eat with. I would like people, regardless of country borders, to get to know and knock the door of deep world of Japanese Sake. I hope someday Sake to be on beverage lists of restaurants all over the world as a matter of course.